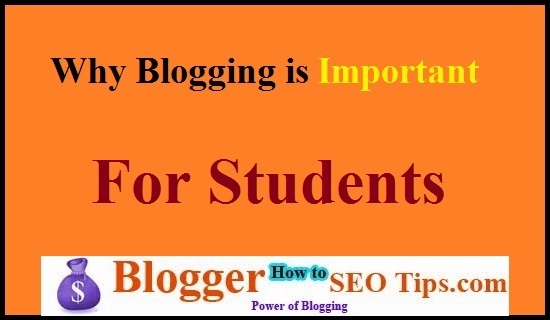 Blogging is important that's 100% true and while your are studying or you may also say in education, in that time, it is play important role to make a better future of your's, also making name in the internet world quiet easily.Because people do study there only two main purposes, those are for money and understanding good and bad in this world. But blogging will let you learn many things, but as a student blogger you would do many mistakes, but you don't will have to, because I am tell you what to do to make good popular money making as well as useful blog for your readers. Well what you should do for becoming a better blogger? Learn First SEO, no I am not going to recommend you buy any book at this stage may be later you can buy, but I will recommend you to read this article, which will let you know almost all concepts you need to know to drive lots of traffic to your blog. I know this is not an easy task, but as a beginner blogger and also as a student, don't choose any topic to blog, in which you are not enough familiar. May be this is blowing on your mind, why am I saying this? Okay, my dear let me tell you the reason, if you are not thinking this even read this, what I am going to tell you, because this is important. Because people will not come to your blog for free, they also searching something, may be some kind of information, so if you are not familiar with the topic you are blogging, then how would be possible, you are going make good reputation on that niche in the internet, that is people will come to your blog again and again, this is needed in blogging, trust as well as repetition of visitors, even you have to waste lot of time to do search and then write with out feeling comfortable. Select topic related to your education no matter in which field you are studying, but do select two to three topics, now do little research work, that is try to know how much people are search about those topics in the internet, after all you are going to get visitors depend on topics, remember more popular topics means more competitions, so choose topic that you can provide better information than others. Then select only and only one topic for starting blogging. For this you can get help from Google Keyword Planning Tool, don't worry it's free, here is the pretty cool video for you, to understand about Keyword Planner much better way. Almost all blogs become popular on their respective niche because of choosing proper domain name, I don't want any of my blog reader, will do this mistake.Even I did this mistake, that's why I took this type of silly but most dangerous mistakes quiet seriously. Okay let me tell you what's that? Don't repeat this mistake again. These three tips are enough for become a good blogger at least for beginners, if you are interesting to learn more about blogging tips then don't forget to read my 36 unbelievable tips about blogging to become a successful blogger. As a mechanical engineering, becoming a well known blogger especially in blogging niche is just a unbelievable things do you know why? Patience of myself has been increase by 500% and that's a great thing to be a successful, happy person for rest of the life. English, the great obstacle as a Odia, Bengali and of course Hindi Medium student and its really great now, as you are reading my blogs and there are half million more. These days I don't need to think about buying any branded cloth rather my friends those are working in good company they need to think. Today I am earning more than my day job and by the end of this year it will multiply, because I am giving my best everyday and I am sure it will work for me. More important, I feel happy when people send me thank you message for having a great blog & My Youtube Channel for beginners to tell the right thing which is working and which is not. Well, after looking at the need a step by step blogging guide, I have created a step by step blogging guide for all those wanted to start blogging for free and here is the Guide to Start Your Blog. There are more than 20,000 people got benefits from the guide and its your time. Best of Luck & happy blogging. Wait, if you have any question then don't forget to ask through comments.